January 24, 2018, 6:00 p.m. The government shutdown had to end quickly. The latest Economist/YouGov Poll suggests that the public wanted compromise and that no party or person was being helped politically by the shutdown. Blame was spread among all involved. Just about half the public blamed each of the players – Congressional Democrats, Congressional Republicans, and President Trump – for the shutdown. While partisanship mattered greatly in how Americans placed responsibility, it’s worth noting that nearly one in five Democrats put a lot of the blame for the shutdown on Congressional Democrats, just as one in five Republicans gave a lot of blame to Congressional Republicans. Just 14% of Republicans gave Donald Trump a lot of blame. As for the single group or person most responsible, more say Democrats and the President than cite the Congressional GOP. But nearly half said Democrats needed to compromise, more than the share naming the President or Congressional Republicans (respondents were able to choose more than one response to the question about compromise), suggesting that Democrats would not have gained if the shutdown continued. 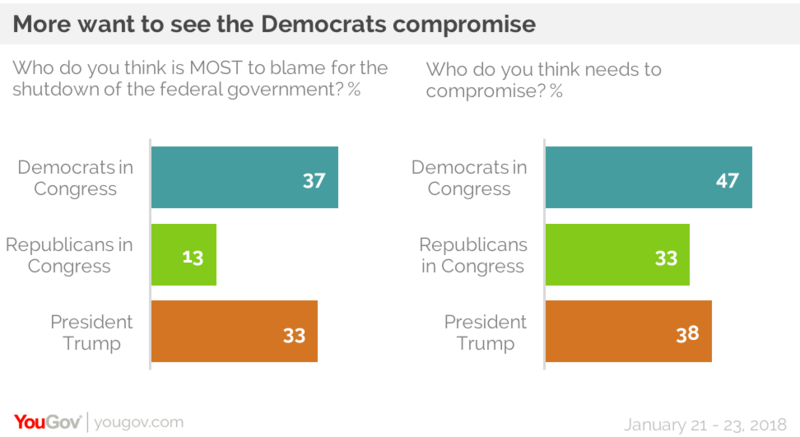 One in five Democrats said their party should compromise, though three times as many Democrats said it should be the Republicans and President Trump who should give in. The poll was conducted mostly while the government was closed, though a number of responses were received after the Congressional vote to reopen the government. 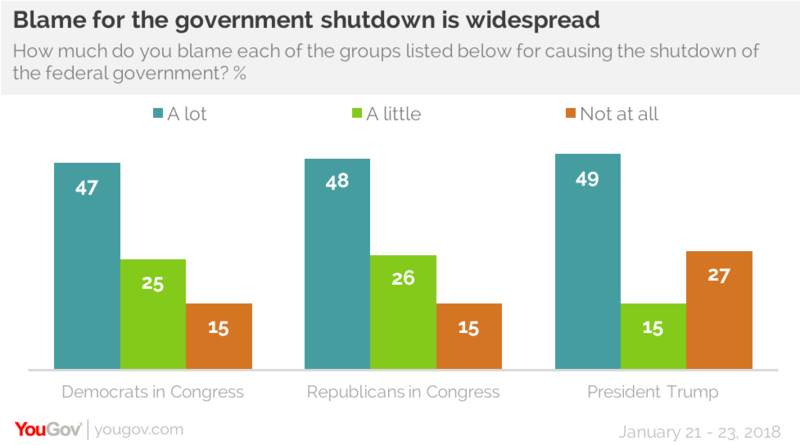 Majorities of all political points of view preferred compromise to a shutdown, even if that meant giving up some of their priorities. 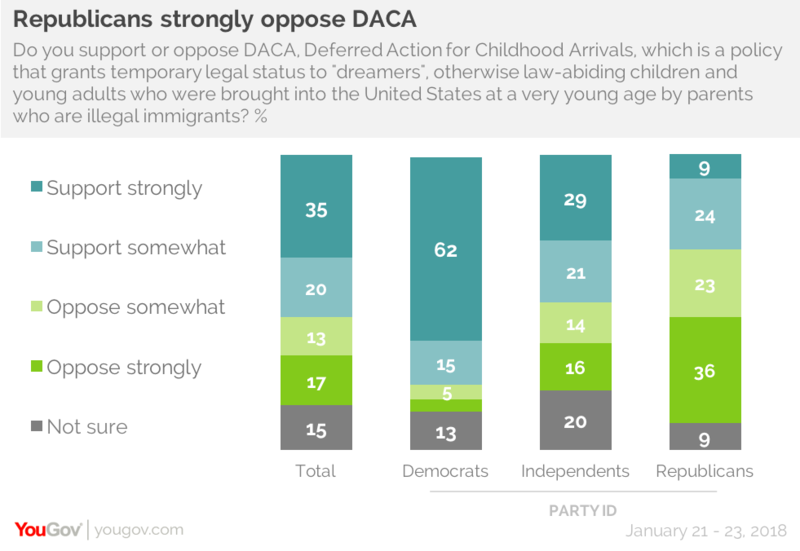 For Democrats, renewing the DACA (Deferred Action for Childhood Arrivals) program was one such priority. While Senate Majority Leader Mitch McConnell promised to schedule a vote on the DACA program in return for Democratic support for the temporary funding bill that re-opened the government, that promise was not included in the bill itself (the bill also provided six more years of funding for CHIP, the childhood health insurance program). The DACA program has been politicized. Republicans in this poll oppose the program, though Democrats and independents are in support. Nearly half of Republicans say they care personally at least somewhat about the “Dreamers,” but that is lower than the nearly two-thirds of independents and the nearly nine in ten Democrats who do. Anti-immigration concern runs deep with the Republican Party today. 62% of Republican say illegal immigration is a very serious problem in the country – though only one in five view it as very serious in their own communities. Nearly half of Republicans want to decrease legal immigration, too. For one in ten Republicans, immigration is now the country’s most important issue. And 78% of Republicans want to build a border wall, twice as high as the percentage of the public overall that says that. Nearly three-fifths of Republicans (59%) want illegal immigrants in general to be required to leave the country. In contrast, nearly three-quarters of Democrats and half of independents would allow them to stay and even offer a path to citizenship, something just 29% of Republicans favor. Another 14% in each party would allow illegal immigrants to stay in the U.S. but not have a path to citizenship. 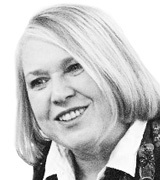 When forced to choose between the possibility of citizenship for illegal immigrants and deportation. 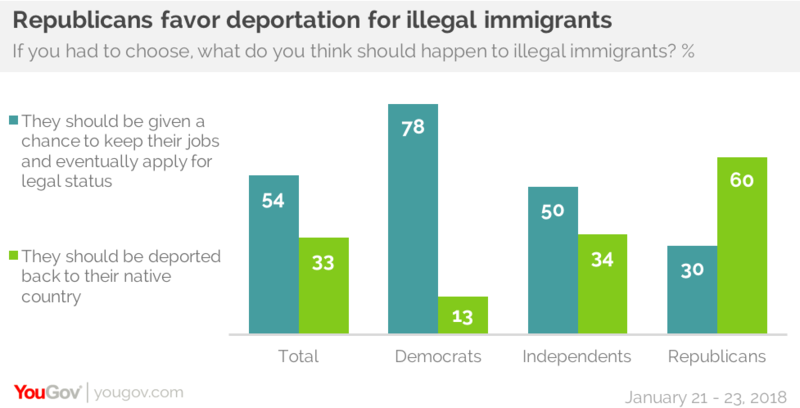 Twice as many Republicans opt for deportation as choose the possibility of citizenship for them, a very different position than that of the overall public. Whether finding a DACA compromise was a necessary price for ending the shutdown was a close call for the public. 43% say having the President and Congress compromise on DACA is more important than ending the shutdown, but 34% said the shutdown should just end. For most Republicans, ending the shutdown was more important than compromise on DACA. There was little evidence of any large-scale change in opinions about the Congressional leadership during and just after the shutdown from what they had been a week before. There were slight decreases in approval and slight increases in disapproval for each of the four House and Senate party leaders. As for opinions of Congress itself, they are even more negative now than they usually are. 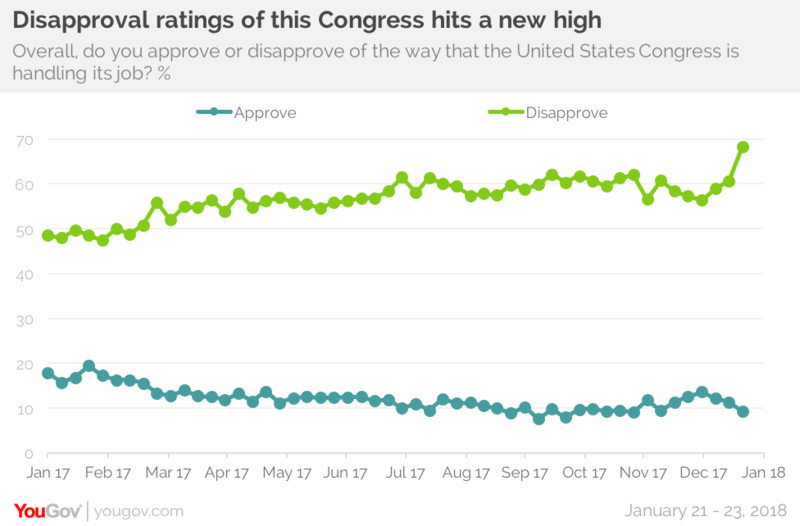 68% of Americans now disapprove of the way Congress is handling its job, up seven points in the last week, higher than it has been in years. Disapproval of Congress rose only 3 points among Democrats, and seven points among independents, but jumped 14 points among Republicans. Nearly two-thirds (64%) of Republicans now disapprove of how Congress is handling its job today.